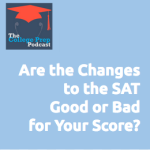 069: Are the Changes to the SAT Bad for Your Score? College Board has made some significant changes to the SAT that will effect most rising juniors. From longer math sections to massive reading requirements, tune in to hear Megan explaining the ins and outs. First, Megan explains exactly how the scores are changing. Action: Keep your ears open to hear how colleges are going to respond to these scores, and to ask at college visits about what their plans are. There will be more evidence-based reading passages, additional graphs, and longer sections. Action: Families can read non-fiction articles together, and practice proving points to each other using the text as evidence. The writing section is changing from single sentence editing to passage-based editing. Action: Keep on studying grammar rules! There will be harder math questions from Algebra II, a no calculator section, and denser reading in the world problems. Action: Consider the ACT for math, or if you’re a fast math learner, consider taking Algebra II as a sophomore. There is a new, expanded essay section that is 50-minutes instead of 25. Action: In the months leading up to the SAT, build up a tolerance for sitting for longer periods of time to answer questions.